In the next of our ‘Meet the Cast’ series we talked to rising star Jamie Marie Leary, who recently performed in the award-winning Expensive Sh*t by Adura Onashile that enjoyed a critically acclaimed run at the Traverse Festival 2016, before touring to Soho Theatre. Here, she talks about her character Rachel, the power of responsive theatre, and the excitement of starting a new project. I started acting when I was in High School. It usually depends on the script and the Company. It’s really important to me that both of these things excite me before starting a new project. My most recent favorite has to be Locker Room Talk by Gary McNair; a verbatim play about the way men discuss woman, that was made in response to Donald Trump’s derogatory comments about females. Work on the play began days after Trump was elected and I think it shows theatre at its best in that it was responsive to recent events, and displayed a strong message that society desperately needs to hear. Jamie Marie Leary in Locker Room Talk. Stand By ticked all the boxes for me, as an actor. It’s fresh, new writing, and I love the relationships Adam has created between the characters. It’s also unlike any play I’ve seen staged and I think that for an audience member it will be very exciting to be a part of. It gives an insight into something that is usually very private; the audiences are a fly on the wall in a situation that we only ever see from the outside, looking in. Alongside this, in very recent times we have seen how important and necessary our emergency services are, and this play gives an in depth view to the pressures they face on a daily basis. In very recent times we have seen how important and necessary our emergency services are, and this play gives an in depth view to the pressures they face on a daily basis. 6. How would you describe your character in Stand By? Rachel is self assured, sharp and witty. She’s very much one of the team but also knows how to put her colleagues in their place very quickly. Jamie Marie Leary and Adam McNamara in Stand By. I would like audiences to feel like that they have been on the journey with us. They, as an audience member, will hear what we hear through earpieces that they are wearing as part of the show. I hope that this makes them feel part of the performance, feeling the apprehension and nerves that the characters feel along the way. 9. If Stand Bycould have a full soundtrack, what 3 songs would be on the album? I just cross my fingers, and hope for the best! 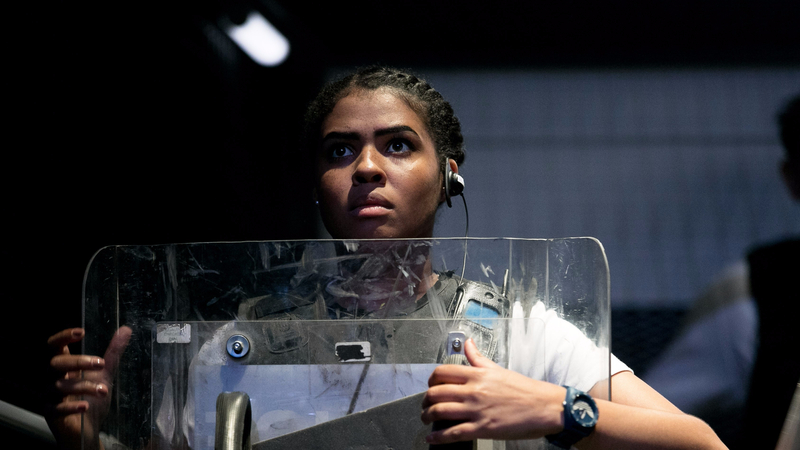 Stand By will preview at The Byre, St Andrews from 4 – 5 August, before making its Festival Fringe debut at Army@The Fringe in association with Summerhall from 11 – 26 August. For full details, read the news announcement.